Selina Surf Club Jaco is the best surf location in the area, directly at the beach in the surf spot (Playa Jaco). Other surfing spots (10minutes): Playa Hermosa, Playa Escondida, Roca Loca, Esterillo Oeste... Waves for beginners, intermediate and advance. You can find the best and more consistent Costa Rica´s waves. Guidings: Selina Surf Team guides will found good waves for your level and surf with you in the best spots. You can book in Selina Surf Club lessons (Surf & SUP), guidings and rentals without accommodation. Surf materials Huge quiver all sizes (soft-boards, fiberglass-boards, epoxy-boards & high-performance boards). Boards for beginners, intermediate and advanced surfers. Equipments are included in surf-lessons.Surf packages included: free surf time with equipments outside course hours. Rental boards service from 14 € per day. Selina’s unique hostel concept has finally arrived in this bustling beach town, a place for friends and meaningful connections to be made. This is where the tribe congregates, whether at our swimming pool, cinema room, or playground. Partner up in salsa lessons, morning yoga, or our weekend dance parties. The restaurant will delight you with eclectic dishes and drinks. From hard-core surfing to family-friendly activities, Jacó has it all. You can ride on horseback through the rainforest or take an ATV tour to waterfalls and beaches off the beaten path. Take a leap, either with a bungee cord or with a zipline through the forest canopy. Other tours include scuba diving, sports fishing, and sea kayaking. The town offers every modern convenience, as well as great cuisine and shopping and an all-you-can-handle nightlife. Breakfast-buffet Lunch & Dinner: local flare with both western and eastern influences. 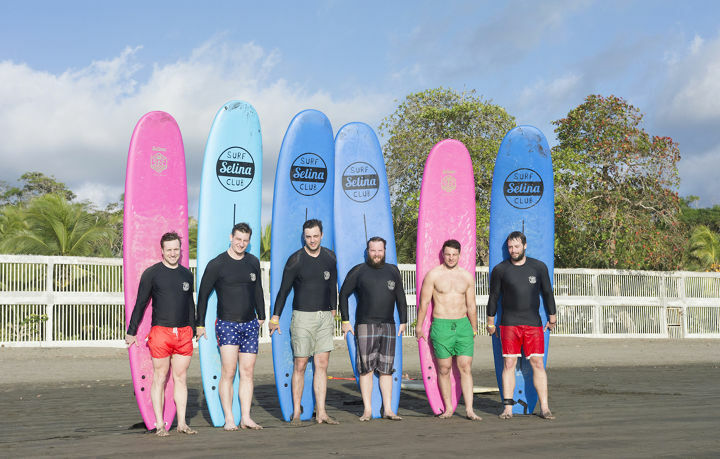 Selina Surf Club presents a whole new way to experience Central America: by wave! Surf and stay with these holiday packages that give you the best of both worlds –surfing and adventure. With these packages, we combine that authentic surf spirit with unique, specially curated Selina experiences. Try surfing for the first time, surf between work meetings, or find your zen with a surf/yoga package. Selina Surf Club Jaco is excited to welcome you to your most memorable holiday yet! Demarcated by Nicaragua in the North and Panama in the South, Costa Rica hugs the Caribbean Sea in the East and the Pacific Ocean in the West. A high plateau divides the American cordilleras in the centre, bordered with low coastal lands in the East and in the West. More of half of the population live in this plain, with a volcanic fertile soil. Mangroves, marshlands and sandy beaches characterize the Caribbean coast, 212 long. More cut and rocky, the Pacific coast spreads out 1 016 km, dotted by gulfs and peninsulas. Costa Rica is home to a rich variety of plants and animals. Over 840 species of birds have been identified in Costa Rica. As is the case in much of Central America, the avian species in Costa Rica are a mix of North and South American species. The country's abundant fruit trees, many of which bear fruit year round, are hugely important to the birds, some of whom survive on diets that consist only of one or two types of fruit. "Pura Vida" is the most recognizable phrase attached to Costa Ricans, and it reflects the inhabitant's positive view of life. Literally translated, the expression means: “pure life” and denotes a simple life, free of stress, a positive, relaxed feeling. Formalities : For French nationals, a passport valid 6 months after your return home is compulsory, a return plane ticket as well.No visa for stays of less than a month. Language : the official language is Spanish. Second lenguage: English. Weather : Costa Rica is a tropical country and only has two seasons: humid and dry. The dry season usually lasts from the end of December to mid-April.The wet season lasts the rest of the year. The Caribbean coast remains humid all year long. Temperatures not change too much. Nearby airports to Jaco: San José (1,30hrs) and Liberia (2,50hrs). Book your Selina Surf club airport transfer. Currency : The local currency is Colon (CRC) but it is not exportable. We recommend you to have US dollars in small denominations and change on the way there. Credit cards are not accepted everywhere. During HOLIDAYS, BANK HOLIDAYS AND SPECIAL EVENTS, cancellations / modifications are free of charge up to 15 DAYS prior your arrival. After that, we will charge your credit card with 100% of the surf camp. Cancellations / Modifications are free of charge prior to 7 DAYS days before your check-in date the rest of the year. After that, the surf package will be non-refundable and you will be charged with 100% of the surf package. We reserve the right and you hereby authorize us to charge your credit or debit card for any damage incurred to your room or the hotel during your stay (including without limitation specialist cleaning) or for any items that are missing when you leave.Same applies for our surf equipment. Different cancellation/modification policies apply for groups. Durante VACACIONES, DIAS FESTIVOS Y EVENTOS ESPECIALES, las cancelaciones / modificaciones son gratuitas hasta 15 DIAS antes del check-in. Con menos de 15 días, cobraremos el 100% del paquete de surf a su tarjeta de crédito Las cancelaciones / modificaciones son gratuitas hasta 7 días antes del check-in durante el resto del año.Con menos de 7 días, el paquete de surf no es reembolsable y se le cobrará el 100% del paquete. En caso de No-show, se le cobrará el 100% del paquete de surf. En caso de daño ocurrido en nuestras infraestructuras no reservamos el derecho de cobrar los daños a su tarjeta de crédito o débito, lo mismo aplica para nuestros equipos de surf o cualquier elemento que falte cuando se vaya de nuestra propiedad. Para grupos, aplican políticas de cancelaciones diferentes. Playa Hermosa, Playa Escondida, Roca Loca, Esterillo Oeste... Waves for beginners, intermediate and advance. You can find the best and more consistent Costa Rica´s waves. "Let the see set you free"
Surfers of all levels are welcome! Selina Surf Club is for everyone, from seasoned pros looking to improve their speed and control to newbies just hopping to stand up for the first time. Our instructors are professional, experienced surfers who help you get the most for your surf experience. Carved up the waves on the lastest advanced equipment in the best hidden spots scouted by Selina just for you. Lessons include personalized instructions, equipments, and access to local surf meccas. Selina’s brand-new property in one of Costa Rica’s most popular destination stands out for its connectivity, sense of community, and commitment to sustainability. You wont want to be anywhere else. Selina’s unique hostel concept has finally arrived in this bustling beach town, a place for friends and meaningful connections to be made. This is where the tribe congregates, whether at our swimming pool, cinema room, or playground. Partner up in salsa lessons, morning yoga, or our weekend dance parties. The restaurant will delight you with eclectic dishes and drinks. From hard-core surfing to family-friendly activities, Jacó has it all. You can ride on horseback through the rainforest or take an ATV tour to waterfalls and beaches off the beaten path. Take a leap, either with a bungee cord or with a zipline through the forest canopy. Other tours include scuba diving, sports fishing, and sea kayaking. The town offers every modern convenience, as well as great cuisine and shopping and an all-you-can-handle nightlife. Reviews on "SELINA SURF CLUB JACO"